Video: The Silver Shroud costume was one of the best gags in Fallout 4, and Bethesda has been keen to keep the joke going in all the DLC, including the latest instalment, Nuka World. Let me tell you, the lines are excellent. FluffyNinjaLlama has documented 10 whole minutes of scenes that can unfold in Nuka World if you happen to wear the Silver Shroud costume, and it's hilarious. Characters will totally respond to your get-up, especially when you're in the Western-themed area of the theme park. There's even a shoot-out and everything! The best part is, these aren't even all the lines that can happen, I've seen at least one other character say something about the Silver Shroud costume. Well-played, Bethesda. This is the sort of attention to detail that makes people love Fallout so much in the first place. 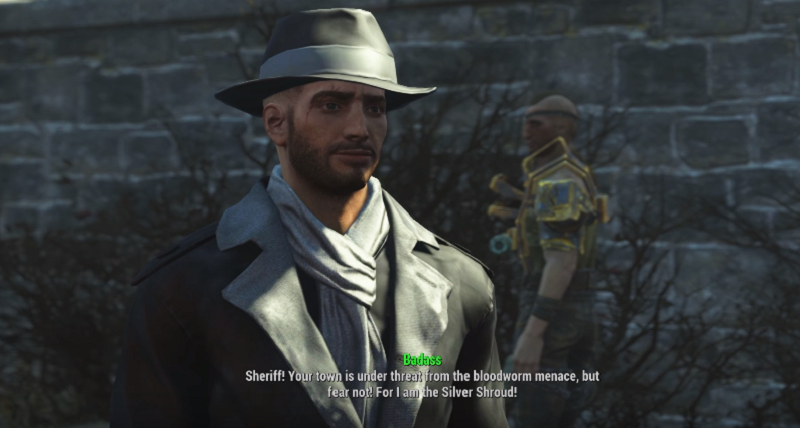 The Silver Shroud quests and dialogue is without a doubt the best part of Fallout 4. I love how people go from treating you like a joke, to taking you seriously, to being convinced you actually ARE the Shroud. "I am an instrument of justice, and I cannot fall. Death has come for you, evildoer! And I am it's Shroud!"